Gerald Focha, 76, of Danville, California died from what appear to be natural causes at the Alaska Railroad Denali Deport on Wednesday, May 27, in spite of the lifesaving efforts by personnel on scene, park rangers, and the local fire department. The National Park Service received a report of a person suffering a possible heart attack at 4:2 7 p.m. on Wednesday, and rangers and an ambulance were immediately dispatched. While enroute the park’s communications center received a second call that the person was not breathing and that CPR was in progress. Upon arrival rangers found Focha was in full cardiac arrest. Ranger-EMTs and personnel from the Tri-Valley Fire Department performed advanced cardiac life support measures in an attempt to restore a pulse, but were not successful. After 40 minutes of emergency lifesaving effort, and after consultation with the park’s medical director physican, CPR and other efforts were terminated. Focha’s wife was accompanying him. His remains were released to the Office of the State Medical Examiner. "Hey everybody This is Kurt calling from overcast Talkeetna. Mike, Ryan, and I have returned to our base after a couple of days of ice climbing on the Matanuska Glacier and some rock climbing today on a nearby crag. It was all good climbing and a great way to finish off this trip. The steep ice climbing and the rock thoroughly rounded out the trip. We had a phenomenal time. Of course it was a great experience for the three of us to succeed on the Japanese Couloir of Mt. Barille. Now we’re going to hang up our boots and go into town and get some food. We're looking forward to enjoying some great climbing adventures in the future." Denali remains enveloped by a low pressure system, and everyone on the mountain appears to be waiting it out. The following satellite telephone dispatch was received from AAI Guide Angela Seidling on AAI’s third Denali expedition of the season. We have not heard from the other teams and assume they are doing the same as Angela and the other climbers on Team 3. Denali Expedition dispatches are normally posted on the "Daily Dispatches and Recent News" page of the AAI website http://aai.cc/currentnews/ . On weekends, they are first published here. "Greetings everybody, this is Angela from 14,000 feet on Denali. We’re still at Camp 3, and we’re still waiting out this storm. It sounds like Sunday or Monday could be the next day for us possibly to be moving. We’re looking forward to that! But In the mean time, we are trying to keep ourselves entertained and as busy as a person can be in a storm at 14,000 feet on Denali. There’s lots of book reading going on and exchanging of books because we've gotten a lot read in the last couple of days. There are lots of good conversations and people strolling around camp in the fresh snow, plus lots of digging out tents and rebuilding snow walls and all that good stuff. Anouk hopes that the Black Beast AKA Cookie Monster, had a good presentation and wants him to know coming to the his presentation last year was one of the best things she ever did in her life. Ranjeet would like to say, 'thoughts of family and friends back home are making the temperatures warmer for all of us up here.' We all agree with that one. OK. That’s the news and thoughts from here. We’ll talk to you all soon. By for now." Believe it or not, there is another kind of climber out there. This is the climber that sees a tower of cement and steel as an objective, not as a place of work. And while this type of climbing isn't terribly legal, it's really cool to watch. Alain Robert is known as Spiderman because he has practiced the art of climbing in the city as much as he has in the mountains. Following are a couple of videos about this urban adventurer. Check out Alain Robert in the first video as he climbs a 46 story skyscraper in Brazil and in the second, watch as he scales the Tour Montparnasse skyscraper in Paris. The active search effort for solo climber Dr. Gerald Myers was scaled back on Tuesday afternoon after search managers determined that further air operations were unlikely to locate him. There has been no sighting of the solo climber or his gear during six days of aerial and ground searching. Although no more aerial flights are anticipated, ranger staff will continue to search through the thousands of high resolution images taken during the aerial flights in search of clues to Dr. Myers whereabouts. Dr. Myers began his summit bid from the 14,200-foot camp the morning of Tuesday, May 19. He was sighted at various elevations along the West Buttress route that day, the highest of which was somewhere between 18,000 and 19,000 feet. Dr. Myers did not return to high camp on Tuesday night. An individual climber was observed on the summit ridge the afternoon of Wednesday, May 20, although it cannot be confirmed that it was Dr. Myers. Dr. Myers was observed carrying only a small daypack with minimal survival gear at the time of his disappearance. He did not take a stove for melting snow, and it is unknown how much food he had in his pack. 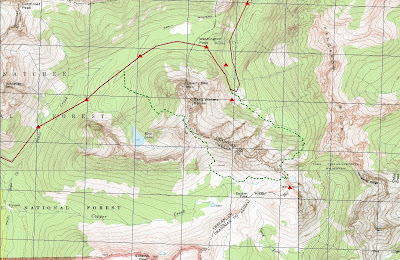 Throughout his climb, Dr. Myers carried an FRS radio and a SPOT locator device; the last GPS location reported by the SPOT device was at the 17,200-foot camp on May 19. Throughout his trip, Myers had been making at least one position recording each day. In light of his limited supplies and the subzero temperatures, search managers consider that survival is outside the window of possibility. Observers have thoroughly searched the route and surrounding areas to the degree that if the climbers were visible on the surface, there is a high probability they would have been discovered. "Hey everyone, this is Dylan Taylor calling from 19,500 ft, on the Football Field just below the summit of Denali. I just made it to the top with Hannah, Ed, and Patrick! It was pretty amazing up there. It was my seventh time on the summit, and I've got to say that it turned out to be one of the best yet. It was the calmest I have ever seen it on top, especially after such a windy start to the day. We had really strong winds, 40-50 mph, around Denali Pass which was almost knocking us over. We measured the windchill at -70 degrees. Folks pulled through though and avoided any cold related injuries and I'm very proud of everyone. Out of the three rope teams we had going for the summit, two had to turn back because some people were getting cold and they needed to not to risk cold injury. Currently the rest of the team is waiting for us down at 17,000 ft. Ed would like to say hi to everyone back home; Patrick says that he sends his love to his girls; and Hannah also says hello. Alright, We'll talk to you all later"
You can follow the progress of three AAI Denali expeditions on the dispatch page of AAI's website: www.aai.cc The URL for the specific page is: http://aai.cc/currentnews/ Use the drop down to follow the team you want. After five days of aerial and ground searching on Mt. McKinley, there has still been no sighting of Dr. Gerald Myers, nor any evidence of a fall or disturbance on the snow surface. On Monday, May 25, two teams of NPS ground crews, one out of the 14,200-foot camp and the other from the 17,200-foot camp, searched near the base of the Messner Couloir and along the ridge above Denali Pass, respectively, but neither team found any clues to Dr. Myers whereabouts. The U.S. Army Chinook helicopters flew early Monday morning, but wind instability at higher elevations turned them back to Talkeetna. As the winds calmed late in the day, the park’s A-Star B3 helicopter was able to fly the search zone and collect photographs in evening light conditions. At the Talkeetna Ranger Station, staff continues to comb through thousands of high resolution images in hopes of detecting clues. Tonight, National Park Service search managers will assess the flight and photo data collected throughout the week and determine whether any additional areas warrant more coverage. 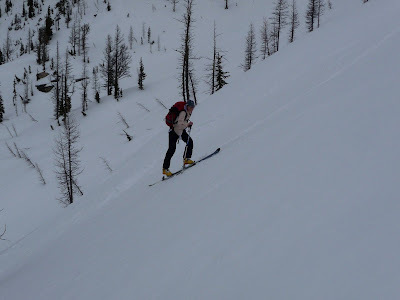 A number of years ago I read a fascinating article about a group of climbers and skiers in Salt Lake City who did most of their climbing and skiing early in the morning before work. The group -- lead by the now deceased super-climber Alex Lowe -- commonly did more before the world got up than anyone. They skinned up steep snow slopes and got first tracks before anyone else was awake. They swung their ice tools well before the sun came up. And they put other early morning athletes to shame in the amount that they got done before rolling into work at eight or nine o'clock in the morning. Lowe called his early morning club, the Dawn Patrol. And since that article was published more than a decade ago, many individuals throughout North America have created their own Dawn Patrols. Approximately a year ago, I moved from guiding over 200 days a year into the American Alpine Institute administrative offices in Bellingham. I have two small children, both of which are under the age of two and I just could no longer be gone as much as I was, guiding full time. The change has been very good for my family. I'm still guiding seven to ten days a month, so I haven't left it completely and probably never will. But my personal adventures have been seriously impacted by these changes. If I go out climbing or skiing on the weekends and it's not for work, there is a definite level of guilt. I feel bad that I'm not spending my time off with the kids, but am instead going out to recreate without them. Eventually they'll be able to join me, but right now they're a bit too young for anything but riding the backpack on easy day hikes. The result is that I've been thinking a lot about the concept of the Dawn Patrol. This spring, I've been trying to take a page out of Alex Lowe's book and I've been trying to do some dawn patrols of my own. It's not terribly easy...especially with small children who don't necessarily always sleep through the night, but the few times that I have gone have been incredibly rewarding. This Spring, Dana Hickenbottom -- another program coordinator -- and I, have gone to Mount Erie in Anacortes twice. The first time we pulled down on a couple of 5.10 sport routes well before our fingers could even come close to warming up for them. And the second time, we completed a pleasant three pitch 5.7 on a nice warm morning. On that second trip, Dana was attacked by at least two very nasty ticks, but tick attacks and potential lyme disease aside, we still had a fantastic time. On both occasions we were basking in the glow of an early morning climbing adventure for the rest of the day. Mount Wilson in Red Rock Canyon at Sunrise. Adventure Film is a film festival based in Boulder, Colorado. Now in its fifth year, Adventure Film was created by a coalition of adventurers, artists, filmmakers and activists to explore the power of storytelling, especially through the narrative of adventure. The organization aims to mobilize people through an awareness of the world. Hence the tagline, "Make Your Own Legends." Every year the international Adventure Film selection committee chooses over thirty new films from approximately two hundred entries from around the world. Awards Winners in nearly a dozen categories are selected, ranging from "Extreme Sport" to "Activism through Adventure." Adventure Film covers risks, mighty and absurd, the unknown and those experiences that bring viewers to the edge of their seats. 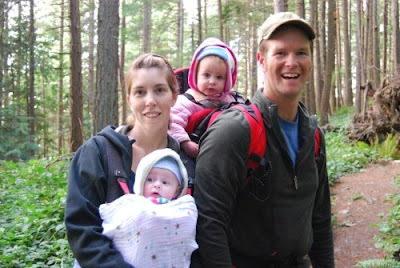 The Mountaineers is pleased to host the first Seattle appearance of Adventure Film on Thursday, June 11, 2009. The doors open at 6:30 pm, the show starts at 7 pm. Tickets are on sale now, and can be purchased through the Mountaineers Bookstore, or by calling 206-521-6001. Steve Swenson is the current president of the American Alpine Club and a member of the Seattle Vertical World. He will discuss his forthcoming trip to an unclimbed 7,500 meter peak in the eastern Karakoram in India as well as climbing in Pakistan, China, and Patagonia. We're always on the lookout for events that bring the climbing community together. If you're aware of an event we don't have posted above, please feel free to email us with all the details. Event posts will be made at AAI's discretion. Jesse Kao called From Denali Team 3 at 6:50 Alaska time to say they had made it to Camp 3 at 14,000 feet and to report the guide Mike Roberts is now learning French. “Hey there. This is Kurt calling after another beautiful day, and a fantastic climbing day in the Ruth Gorge. I’m happy to tell you that Mike, Ryan, and I were totally successful in climbing the Japanese Couloir, summiting around 10:10am. It was a lovely day, though soft snow made the climbing a little challenging. We got back to camp early this afternoon, and we’re now all settled in at about 7:00pm our time. We’re drying out our gear and watching the sun slowly dropping a little. We tried to send you a photo on my new iphone, but I don’t know if it went through. But we’ll have a full photo report later regardless. Well, the Alaska climbing season is in full swing around here these days so I thought it was about time I paid tribute to the incredible climbing that can be found in that beautiful land to the north. So prepare to be blown away by the grandeur of the Alaska Range with it's impressive glaciers, sheer rock faces and incredible summits. The first video documents an ascent of the Moonflower Buttress (AK Grade VI, M7/WI6) on Mt. Hunter. The entire climb, from camp to camp, took 44 hours! It is a great mix of photos and short video clips of the remarkable climb. The second video is a photo essay from Chris McNamara, the founder of SuperTopo. In it he documents some of classic big wall climbs in the Alaska Range. If you enjoy looking at incredible lines and breathtaking scenery then watch this video!!! The final video showcases the summit of the "High One", Denali. It is actually shot by our former Alaska Program Coordinator and guide Coley Gentzel, who now happens to be a climbing ranger for Denali National Park. Quite a view from the top eh? In Juneau, Alaska, as the glaciers continue to melt, the land is actually rising. At a rate of 10 feet in the last 200 years, the melting is depositing so much sediment that local streams are drying up and having an effect on the salmon and many local ecosystems. The geology is complex, but it boils down to this: relieved of billions of tons of glacial weight, the land has risen much like a couch cushion regains its shape after someone gets up from their seat. The land is ascending so fast that the rising seas — a ubiquitous byproduct of global warming — cannot keep pace. As a result, the relative sea level is falling, at a rate "among the highest ever recorded," according to a 2007 report by a panel of experts convened by Bruce Botelho, Juneau's mayor. In some places along the coast, the change has been so rapid that kayakers whose charts are not up-to-the-minute can find themselves carrying their boats over shoals that are so high and dry they support grass or even small trees. A few decades ago, large boats could sail regularly along Gastineau Channel between downtown Juneau and Douglas Island, to Auke Bay, a port about 10 miles to the northwest. Today, much of the channel is exposed mud flat at low tide. "There is so much sediment coming in from the Mendenhall Glacier and the rivers — it has basically silted in," said Bruce Molnia, a geologist at the U.S. Geological Survey who studies Alaskan glaciers. "The land is rising almost three inches a year", Molnia said, making it "the fastest-rising place in North America." The rise is further fueled by the movement of the tectonic plates that form the Earth's crust. As the Pacific plate pushes under the North American plate, Juneau and its hilly Tongass National Forest environs rise still more. "When you combine tectonics and glacial readjustment, you get rates that are incomprehensible", Molnia said. An initial aerial search for an overdue climber on Mt. McKinley was flown on the morning of Thursday, May 21 by an Air National Guard HC-130 Hercules aircraft. There were no initial sightings of the solo climber, although considerable cloud cover and high winds at upper elevations greatly limited the search. Gerald Myers, a 41-year-old resident of Centennial, Colorado, began a long solo bid for the summit during the early morning hours of Tuesday, May 19. According to a note left for his three climbing partners, Myers departed the 14,200-foot camp around 4:30 a.m. Myers was next seen at the 17,200-foot high camp at approximately 11:00 a.m. that same morning, grabbing his skis and digging into a cache that the team had left there on a previous acclimatization day. Other sightings that afternoon were made on the traverse to Denali Pass at 18,600 feet and then again near 18,900 feet. According to NPS rangers on patrol at high camp, Myers did not return to camp Tuesday night. During their investigations the following day, rangers learned that Myers was seen by another party at approximately 2:45 p.m. on Wednesday May 20 as he climbed the ridge approaching the mountain’s 20,320-foot summit. A subsequent team travelling approximately two hours behind the earlier party did not see any sign of the soloist during their summit bid; Myers did not return to high camp Wednesday night. At the time, weather high on the mountain was deteriorating with winds gusting 40 to 50 mph. Myers was reportedly carrying skis on his backpack when he was spotted near the summit. Based on equipment left at various caches on the mountain, it is expected that Myers was carrying minimal survival gear at the time of his disappearance. While he departed camp in warm clothing, Myers was travelling light and did not appear to take a sleeping bag, thermal pad, bivy sac, or a stove for melting snow. It is unknown how much food or water he had in his pack. According to his partners, the climber was likely carrying his FRS ‘family band’ radio as well as a SPOT locator beacon. Myers had programmed his SPOT device with three button settings: “OK, moving up”, “OK, but not moving”, and “911”. According to the GPS data recorded by the SPOT, the last electronically recorded location was the 17,200-foot camp at 10:50 a.m. on May 19, when Myers had recorded his position by pressing the “OK, moving up” button. Throughout his trip, Myers had reportedly been making one position recording each day. Aerial searching will continue as visibility and winds allow. 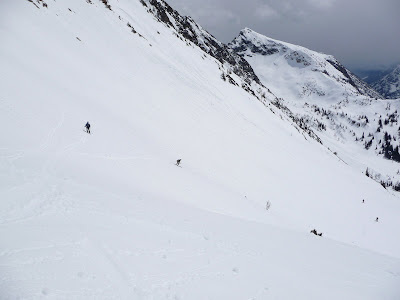 NPS rangers and volunteers at the 14,200-foot camp and at high camp have been conducting visual searches via spotting scope of possible ski descent routes. Currently, visibility is generally obscured by clouds, with wind gusting to 45 mph near the summit. Four artists, including John Morgan, an award winning Fairbanks author, will be participating in this year’s Artist-in-Residence program at Denali National Park and Preserve. Artists Bill Brody and Karin Franzen, both from Fairbanks, Alaska, and Gail Niebrugge from Palmer, Alaska, were selected from over 50 applicants from throughout the United States and abroad. There was a strong interest in the Artist-in-Residence program this year, which included applications from artists as far away as Azerbaijan, South Africa, and Suriname. snow-capped peaks of the Alaska Range, and the lush tundra of the Plains of Murie. John Morgan was invited to be Denali’s first Wrier-in-Residence, which expands the Artist-in-Residence program at Denali to include non-visual media. He moved with his family to Fairbanks in 1976, where he teaches in the graduate Creative Writing program at the University of Alaska. He has published three books of poetry, and his work has appeared in The New Yorker, Poetry, The American Poetry Review, The Paris Review, The New Republic, and in many other magazines and anthologies. Bill Brody is an artist and printmaker who obtains inspiration for his work from the wilderness landscapes that he has been able to explore over the years. The sketches, journals, and photographs he makes during his explorations are source materials for paintings, prints, and very large-scale works on forged and carved copper and bronze. He is a professor emeritus of the University of Alaska Fairbanks (UAF) Art Department, and he is known for his innovative work on the Body Language User Interface (BLUI) project at the Arctic Region Supercomputing Center at UAF. The work of fiber artist Karin Franzen is widely known and she has been in several important international and national exhibitions, including “Quilt Visions 2008: Contemporary Expressions", "“Quilts of the Pacific Rim”, and “Made in Alaska”. Her work revolves around one of her favorite subjects, the birds of Alaska. Franzen uses the skills honed over a lifetime: drawing, mathematics, structural design, sewing, an understanding of biology, and business acumen to create her work. Long time Alaska painter Gail Niebrugge is known throughout the world for her use of pointillism, small-dot like strokes, in her work. A five time winner in the National Diabetes Association’s Holiday Art Search, Niebrugge’s artwork has appeared on hundreds of thousands of Christmas cards sold nationwide to benefit diabetes research. She has completed seven major public commissions in Alaska, including a ten panel multi-dimensional artwork for the U.S. Customs in Skagway. She was the first artist-in-residence for Wrangell-St. Elias National Park and is the author of “Gail Niebrugge’s Alaska Wildflowers”, a book about her thirty-three years of work focused entirely on Alaska. All of the artists will offer a public presentation for visitors during their residency. Each will donate a piece of artwork to the park’s art collection that was inspired by their time out in the park. The pieces donated by artists-in-residence from previous years are on display in the Denali Visitor Center and the Eielson Visitor Center, which opens for the season on June 1. The Artist-in-Residence program is a national program that enables established artists to reside in a park while they create park-related art. Artists have played a significant role in raising public awareness of the natural wonders preserved within the National Park System and the need for their protection since the creation of Yellowstone, the first national park. This is the eighth year of the Artist-in-Residence program at Denali National Park and Preserve. Twenty-three artists, including thirteen from Alaska, have participated in previous summers. Beginning May 18, 2009, the application process for the artist-in-residence program will be completely online. Applications for the 2010 season must be submitted by October 31, 2009. Visit http://arts.alaskageographic.org for information and to apply. Standard snow anchors are comprised of pickets, flukes, bollards and deadmen. As stated in previous blogs, sometimes people overlook items that might be used as deadmen such as packs, crampons, ice axes, skis, trekking poles, and stuff sacks filled with snow. Quick snow anchors can be devised from just about anything...including your body. Most of you are probably familiar with Simon Yates and his infamous snow seat in Touching the Void. To say the least, that was an unusual situation. To create a quick snow seat you must simply sit down in the snow, arc your legs, and stomp your heels into the snow. After you've achieved this position, you will be able to put a climber on belay. However, if the climber takes a fall with slack in the rope, it is possible that you may be pulled out of the snow seat. There are two ways to keep this from happening. The first way to deal with a potential shock-load in a snow seat is to add a snow anchor to back it up. This could be anything, but many climbers will simply use their ice axe. The belayer must then clip the climbing rope (which is tied to the climbers harness) to the snow anchor. Most will just make a clove-hitch with the rope and then slide the shaft of the ice axe down through the hitch. If the belayer has elected to use a hip belay, the tie-in must come off the same side of the climber's body as rope running to the climber, otherwise the load will twist the belayer uncomfortably. The second way to deal with this is by using a dynamic belay. In other words, when the climber falls, allow the rope to run through the belay device for a short period of time, slowly breaking it and bringing it to a stop. This allows the snow seat -- and you -- a much smaller shock. There are clearly some problems with this technique and it cannot be used in every situation. 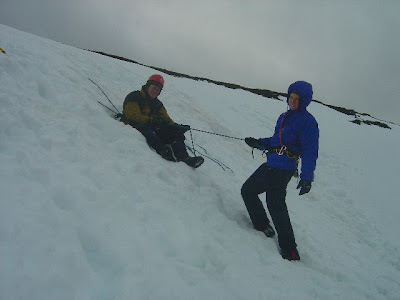 The dynamic belay is only truly useful on steep snow climbs where there is little danger of a falling climber hitting something. If we learned one thing from the Simon Yates in Touching the Void, it's that snow seats are an excellent option in terrain where you do not anticipate a need to escape the belay. If there is anything suspect going on, it's important to build a bombproof SERENE/ERNEST anchor. "We're here in the sun at 17,200 feet ready to make a bid for the summit. We'll leave in just a few minutes. We are worried that some poor weather may be coming in over the next few days, so this might be our best shot. Wish us luck!" Dispatches are posted M-F on the dispatch page. Aside from special events, they are posted on this blog only on the weekends, and on Monday they are moved to the dispatch page. “Hello everyone. This is Dylan calling for members of Team 2 to give you an update. We had a great day today. The weather was perfect, and we carried from Camp 2 here at 11,000’ to 13,500 where we made a cache. We’re back here for the night, and we hope to move up to Camp 3 at 14,000 feet tomorrow. Everyone is on good health. There is one case of tendonitis, but aside from that, everyone is feeling healthy, adjusting well to the altitude, and sporting a big appetite at every meal! So we’re all doing fine and are really pleased about our steady progress. “Good evening everyone. Today we had an excellent climb to 16,200' at the top of the West Buttress to put in a cache. We’re back at Camp 3 now [14,000’], and tomorrow we plan to establish and occupy Camp 4 at 17,200'. We’ll probably take a rest day at Camp 4 on Monday and head for the summit on Tuesday or Wednesday, but we could also climb on Monday if the weather forecast is for deteriorating conditions for the later days. Right now the weather is perfect. We'll probably call you tomorrow and let you know what we are thinking. Everyone is feeling really great. It’s a great team. Hello again all you Weekend Warriors! One of our program coordinators, Ruth, just got back from a roadtrip down to the granite mecca that is Yosemite. So, in the spirit of her return I thought I would put together a compilation of videos the highlight the incredible climbing found in the Valley. If you haven't checked out Yosemite for yourself it is well worth a visit...just be ready to fight the crowds if you go during the busy season. 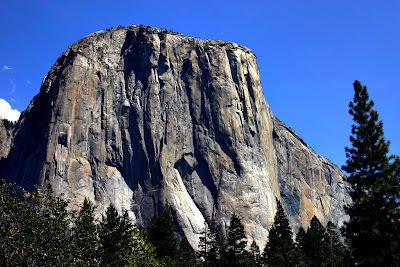 The first video on the lineup is a great showcase of the classic line on El Capitan, The Nose. Most parties take multiple days on this route and use ropes...but not Dean Potter. He decided one day to solo the line and make a video documenting the ascent for the rest of us to enjoy. The second video also features El Capitan but this time it's being climbed by two uber strong brothers, the Hubers. The video is actually a trailer for a film I still need to see called "To the Limit", which documents the brothers attempt at a new speed record on the Nose. The final video is a wonderful little potpourri (thank you spell check!) of flora and fauna mixed with some great looking climbs. And it is all set to a catchy beat that got my feet tapping and anxious to jam into some cracks! 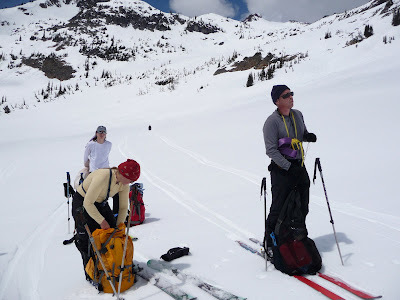 The Birthday Tour is an extremely popular one-day backcountry ski adventure in Washington State's Washington Pass. 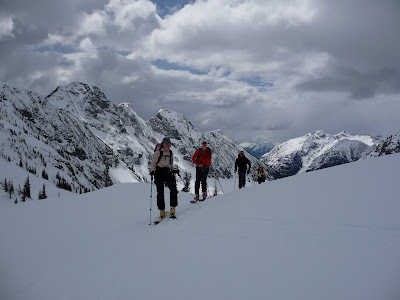 The recent plowing of highway 20 and sunny spring weather opened up a large area of easy access backcountry skiing this month. 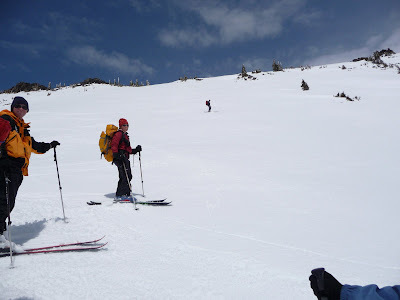 The Birthday Tour is an extremely popular one-day backcountry ski adventure in Washington State's Washington Pass. 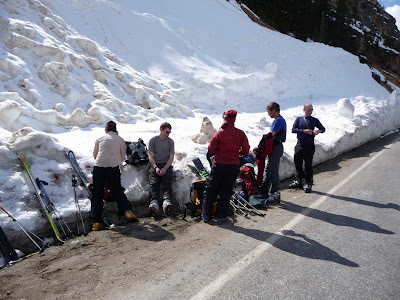 Four skiers from Bellingham Mountain Rescue and a few friends saw stellar weather in the forecast last week and took the opportunity to ski the Birthday Tour. The hardest part was finding a place to park in the very popular Washington Pass area, as many skiers headed for the backcountry. Leaving a car west of the pass, we started at the Blue Lake trailhead and skinned up to the col south of Early Winters Spires. The rugged scenery was spectacular with a fresh coat of new snow. The thin clouds allowed a perfect panorama of the distant peaks. Snow made for great skiing above 6700 feet. It was a little bit mushy below that. It was the first time any of us had done the route but it was definitely unlikely to be the last. We discovered a fantastic new playground! Glad to be back to the route after a long day of skiing in the sun. The ascent just south of Liberty Bell is nice and wide, offering many options for grade selection. AAI guide Jeff Ries pause to rest and admire the scenery after skiing part of the way down form the col. Okay, I admit it, I'm not Shakespeare and even the most serious of free soloists is nowhere near as depressed as the Prince of Denmark. But I have spent a fair bit of time thinking about both Hamlet and daisy chains. I know some of you are wondering how they are connected. They're not...except in my very bad Shakespearean verse. Daisy chains are a very tricky tool. When used correctly than can be tremendously valuable to a climber. When used incorrectly, they can be incredibly dangerous. A daisy chain is a length of webbing that is easily identified by the sewn loops the run the length of the chain. One end of the daisy is usually girth-hitched through the tie-in point on the climber's harness. 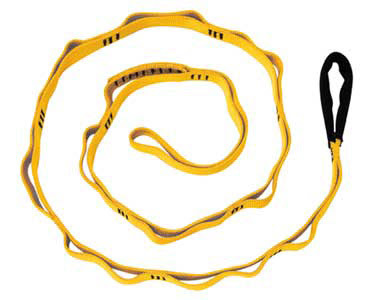 The loops on the length of webbing may then be clipped with a carabiner and attached to an anchor, providing a safety attachment for the climber. The main advantage to the use of a daisy chain is that most people leave them permanently affixed to their harnesses. As such, when they get to an anchor they can quickly and easily clip in. 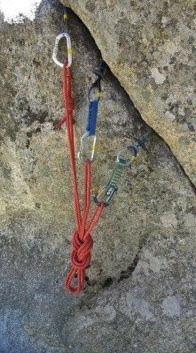 The use of daisy chains is especially valuable when one is trying to set-up a top-rope and needs to clip into something near the lip to remain safe or when one needs a safety attachment for a series of rappels. It is possible for a daisy chain to fail. If you clip the end of the chain and then clip a loop, the internal loops can come apart as well, causing a catastrophic failure. There are two ways to avoid this. First, you can put a twist in the end of the daisy so that it cannot fail. Or second, it is possible to use two carabiners. There is another alternative to the daisy chain. The PAS (Personal Anchor System) is a series of independent loops that are sewn together in a chain. Climbers who use the PAS will use it in much the same way as a daisy chain, but do not have to worry about catastrophic failure. Some climbers elect to girth-hitch the daisy directly to the belay loop. If you attach it directly to the belay loop, this very important part of the harness may see damage. Once something is girth-hitched to the belay loop, the loop is no longer allowed to shift at the tie-in point. This causes the loop to get rubbed in the same spot repeatedly. In addition to this, the loop is crushed by the girth-hitch, which may also accelerate the damage to the loop. The preferred attachment to the harness should be via the tie-in point. A girth-hitch through the tie-in will do significantly less damage to the harness and will ultimately be safer. Most guides do not use daisy chains or the PAS. Instead, they will use their rope to tie directly into the anchor with a clove-hitch. The advantage to a clove-hitch is that it is adjustable once you are off belay. There are styles of daisy chains which allow this, but the amount of adjustment provided is minimal. With a rope, one has the ability to make major adjustments. For example, it's nice to tie into the anchor with a clove, then give yourself enough slack to go back over to the edge of the cliff, so that you can hear and be heard. Guides often use slings in lieu of a daisy chain. The is because there is little need of a daisy in most multi-pitch environments. Daisy chains are most useful in either a single pitch or an aid climbing environment. If you're climbing primarily in these environments, then you should definitely consider using a daisy. If you only occasionally play in these types of environments, then a couple of slings are much lighter and can be used in more applications. Unfortunately the satellite phone connection was weak and cut out frequently, however, we were able to get the bulk of the message. "Hi everyone! This is Paul with a West Buttress dispatch for Team 1. Today we went and carried a cache up to 13,500'. It's been quite windy (surprise, surprise), but everyone is doing very well. Tomorrow we'll continue up the mountain and establish camp at 14,000'. That's it from this end. We'll call you when we get to 14 camp. Remember to check our dispatches webpage for trip updates called in during the week!